Born in Minnesota and having lived in Seattle for most of his life, Tarjei Nossum is somewhat new to the Fargo art scene, but that hasn’t stopped him from taking advantage of all the opportunities the art community provides for local artists. Nossum has made a name for himself in a downtown Fargo art studio space provided by the Arts Partnership since he moved in July 2017. It is here he practices an art that most don’t fall into or understand: glass art. Nossum started making glass art in high school as a sophomore, when he was starting to lose an interest in art. His art teacher knew his talent and pushed him to stay in it and try something new. When his class did an art assignment, a fused glass tile, it piqued his interest and he explored his creativity with glass in a junior year independent study class. After graduating high school, Nossum went on to work in a glass-blowing studio, created a studio of his own, and then attended Pilchuk Glass School where he experimented and grew as a glass artist. When asked where he gets his ideas for a piece, the glass artist smiled. Many of his pieces are influenced by movement, or a flowing aspect such as water or wind. Before Nossum moved to North Dakota, a car accident resulted in a bad knee injury, limiting his mobility to run or bike anymore. Having to give up these lifelong hobbies, he chose to evoke movement in his glass work, incorporating his own emotions through his art. 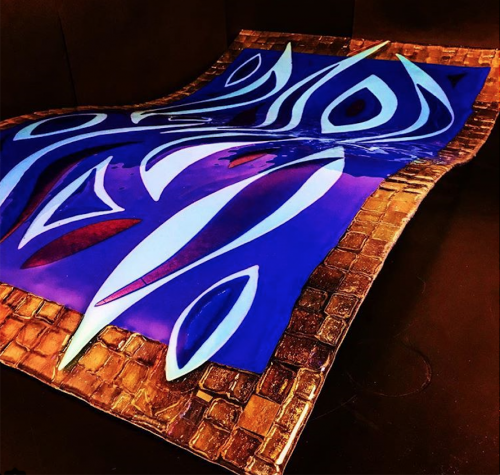 One of his latest, commissioned pieces, “Wave of Time,” 24”x40,” was formed by a combination of techniques involving fusing and slumping of the glass. Nossum explained that he used to draw out his designs before starting, but now just imagines it in his mind, cuts the bigger pieces of glass out first and then figures it out as he goes. He cuts the glass when it’s cold, like you would with stained glass, and then lays out the design. When he transfers it to the kiln, Nossum places it on fiber paper and heats the kiln up to 1,500 degrees Fahrenheit very slowly. Once the temperature is hit, it will stay there for less than a minute and then start to cool down again. He’ll stop the kiln at 1,000 degrees and let it “soak” in the heat for about two hours, depending on the size of the piece, and then let it step down to room temperature from there. Nossum said white is a harder glass, whereas black, blue or clear glass is more bendable, softer. If the mold gets too hot too fast, and the glass is too cold, the glass will break. Nossum said that on kiln days he will usually sit and watch the glass as it soaks, especially when slumping the glass. Materials aren’t cheap when you’re a glass artist, so Nossum takes care to thoroughly think through his process. If you find yourself with artist block and can’t seem to stay motivated to make art, Nossum says to surround yourself with creative people and go to network meetings.